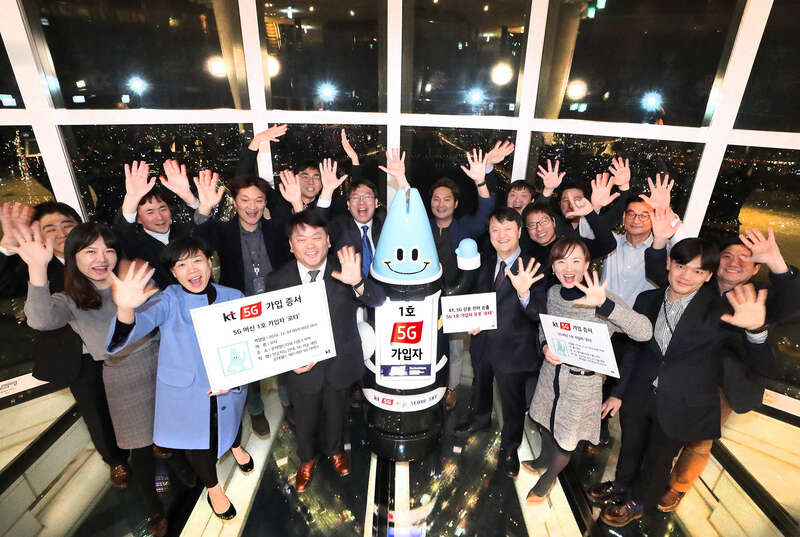 Lota, an AI robot and the first subscriber to KT’s 5G network commercial service, cheers with KT officials at the Lotte World Tower on December 1. PHOTO from KT Corp.
South Korean telecommunications company KT Corporation has introduced new 5G services ahead of fully launching its next-generation wireless network in March. In December, it unveiled the country’s first robot café at the landmark Lotte World Tower in Seoul. The AI-equipped guide robot named Lota was the company’s first 5G subscriber. In a statement during the launch last month, KT said the robot will guide visitors through the Seoul Sky Observatory, which sits on top of the landmark 123-storey, 555-meter-high Lotte World Tower. The Korean telecom leader said it selected an AI robot as its first customer to symbolize its new 5G network service – providing a platform for innovation across the spectrums of business and people’s livelihoods. Earlier this month, KT also unveiled a world-first 5G bus in downtown Seoul during a promotional event. In the 5G-connected limousine bus, passengers experienced various Augmented Reality (AR) and Virtual Reality (VR) services available from the company’s GiGA Live TV. GiGA Live TV is a wireless network-based, next-generation service that does not require separate terminals such as a smartphone. Bus passengers could experience immersive media services from GiGA Live TV, which are available through a 5G mobile hotspot (MHS) catching signals from nearby base stations, the company said. “The new 5G network’s ultra-connectivity and ultra-low latency will greatly contribute to human welfare not only in Korea but also around the world,” said Chang-Gyu Hwang, KT Corp. Chairman and CEO at the World Economic Forum Annual Meeting in Davos, Switzerland in January 2019. KT deployed the first phase of its 5G network in late November. The new service has begun in the greater Seoul metropolitan area, in the country’s most populated, major metropolitan cities outside Seoul and in isolated areas including Jeju, Ulleung and Dok islands. The company said it plans to expand its nationwide 5G network to 24 major cities, key transport routes such as expressways, subways, high-speed railways, large universities, and neighborhood shopping areas. It is currently working with partners in Korea and around the world, such as Samsung Electronics, Hyundai Mobis, Posco, Intel, Ericsson, Nvidia, and Qualcomm. South Korea’s commercial 5G network is expected to create at least 30.3 trillion won in socioeconomic value in 2025, 1.5 percent of the country’s gross domestic product (GDP), according to a report by the KT Economic and Management Research Institute (KT EMRI). The report forecasts that the number will increase to at least 47.8 trillion won, which is 2.1 percent of the GDP, in 2030.